See the new “Philip Hyde Video” produced by Lumiere Gallery. Born in San Francisco in 1921, Philip Hyde was a pioneer of the West Coast tradition. He made his first back country fine art landscape photograph in 1942 and gradually lost his eyesight 1999-2000. His photographs helped protect such national treasures as the Grand Canyon, Dinosaur National Monument, Denali, Tongass National Forest, Canyonlands, the Coast Redwoods, Point Reyes, King’s Canyon, the North Cascades, Oregon Cascades, High Sierra Wilderness, Big Sur, the Wind River Range, Islands off Puerto Rico and many others. Philip Hyde trained under Ansel Adams, Edward Weston, Minor White, Imogen Cunningham, Dorothea Lange, Lisette Model and other definers of the medium at the California School of Fine Arts, now the San Francisco Art Institute. Because of the historical significance of his work, a common misconception is that Philip Hyde was a photographer of a bygone era. In reality, he photographed for 58 years until he was 79 years old, into the new millennium. His work was always ahead of its time and went far beyond the classical landscapes for which he is known. His unique photographic vision and novel compositions are widely emulated today. He is generally acknowledged as one of the most influential of all outdoor photographers. A large body of his work from the 1990’s from Europe, Canada, Mexico, Hawaii and the Midwestern U. S. has never been seen by the general public. Two of his most noted images displayed at www.philiphyde.com are his 1964 color conservation icon, “Cathedral In The Desert, Glen Canyon,” that American Photo Magazine named one of the top 100 photographs of the 20th Century and “The Minarets From Tarn Above Lake Ediza,” a vintage black and white photograph, made in what is now the Ansel Adams Wilderness in the Sierra Nevada. Ansel Adams said that he liked this 1950 photograph of the Minarets better than his own. 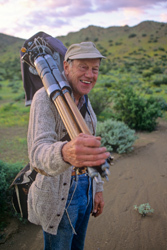 To learn more about Philip Hyde go to PHILIP HYDE SHORT BIO or go to Philip Hyde’s Sierra Club History Page. Hi Cathy, Thank you for stopping to see the Smith Andersen North vintage exhibition and for your kind words about my father. Touching people deeply is the goal of any good art but often photographers let their quest to make a living interfere with this ultimate ideal. To expand on what you mentioned about the “frame shop”, Smith Anderson North was originally a frame shop and small gallery in San Rafael. The proprietor Stefan Kirkeby just moved the business up the street and across into San Anselmo. The gallery space is now about four times as big or more. Stefan Kirkeby was raised in museums and has been framing photographs much of his life. He does the framing for the major museums in Northern California. For example he just framed the famous (perhaps infamous in San Francisco) Fisher Collection. Stefan Kirkeby has developed a following of dedicated collectors of fine art photography and landscape photography. Hi I am a photo student in Upstate NY, we have to do a paper on a photographer whom interest us and choose to imulate. I love your fathers work and the true beauty of nature that he captures. His statement of how so many people run through life and never enjoy what surrounds them is how I feel. I live in the middle of the Adirondack Park and feel blessed everyday for the gift of nature I have just outside my window. Thankyou for keeping your Dads wonderful compositions that nature shared with him so he could share with others alive. Hi Lisa, thank you for the compliments and supportive well-wishes. I am available if you need my help with your project. I will send you Dad’s short bio, artist’s statement, list of books as primary illustrator and other information on him by e-mail. I also appreciate you sharing about your connection with nature. You are fortunate to have discovered some of the best gifts life has to offer at a young age. Hello, It was by my daughters school photography project that I have fallen in love with the work of Philp Hyde. She had to choose a photographer that she admired to do a report on, and she chose well! She brought Philip Hyde into our world! My father, a fisheries and wildlife biologist, passed away at the age of 88 this year and my daughter in all her beautiful wisdom said to me “maybe they met each other in heaven”. I am sure they did. Thank you for your continued work for those who appreciate it so much!! Hi Casey, Great to hear of your daughter’s project and its ability to captivate you. I like to imagine many friends are reunited or happily met on the other side. Just discovered that for the past 9 years I have been living down the road from a friend of yours, Topher Hansen! Got to chatting today and he asked if I knew about Philip Hyde and I said of course….then he told me that you and he have been friends for a number of years….small world! Hi Bill (that’s what Topher called you), thanks for visiting and writing me here. I just looked at your website. Interesting you can make such nice images right around the neighborhood there where I’ve been. Michigan is so flat, but I have now seen a number of photographers make excellent photographs up there. I appreciate you taking the time to create this post. It continues to be really useful.